Under article 297 of the Constitution, all lands, minerals and other things of value underlying the ocean within the territorial waters or the continental shelf of India vest in the Union to be held for the purposes of the Union. India has sovereign rights over the resources of the exclusive economic zone and is entitled to exercise jurisdiction in respect of certain other matters. It is proposed to amend article 297 of the Constitution so as to provide that all lands, minerals and other things of value underlying the ocean within the exclusive economic zone of India and all other resources of the exclusive economic zone of India shall also vest in the Union and be held for the purposes of the Union. At present, the limits of territorial waters and the continental shelf are determined by Proclamation issued by the President. It is proposed that the limits of the territorial waters, the continental shelf, the exclusive economic zone and the maritime zones of India shall be as specified from time to time by or under law made by Parliament. 2. Recourse was had in the past to the Ninth Schedule whenever it was found that progressive legislation conceived in the interest of the public was imperilled by litigation. Certain State legislations relating to land reforms and ceiling on agricultural land holdings have already been included in the Ninth Schedule. Certain amendments made to these legislations also require protection of the provisions of article 31B inasmuch as in many cases such enactments have been challenged in courts and courts have granted interim reliefs which has hampered the implementation of the national land reform policy. 3. Besides these Acts relating to land reforms certain State enactments relating to private forests require protection of article 31B as these enactments are progressive and beneficial pieces of legislation intended to and the monopoly of vested interests and forest contractors. Some of such legislations have been challenged in courts and as the courts have granted interim reliefs staying the operation of these enactments, the State Governments have not been able to implement these legislations. 4. Certain Central laws like the Smugglers and Foreign Exchange Manipulators (Forfeiture of Property) Act, 1976, the Urban Land (Ceiling and Regulation) Act, 1976, the Essential Commodities Act, 1955 and certain provisions of the Motor Vehicles Act, 1939 require protection of article 31B. If these legislations are allowed to be challenged in courts of law thereby delaying the implementation of these laws, the vary purpose of enacting these laws would be frustrated and the national economy may be severely affected. 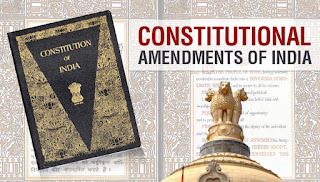 These and other important and special enactments which it is considered necessary should have the constitutional protection are proposed to be included in the Ninth Schedule. 5. The Bill seeks to give effect to the above objects. NEW DELHI; H. R. GOKHALE. 1. 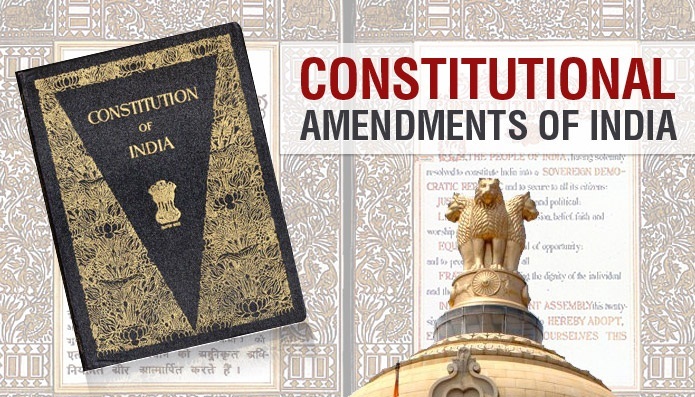 Short title.-This Act may be called the Constitution (Fortieth Amendment) Act, 1976. "297. Things of value within territorial waters or continental shelf and resources of the exclusive economic zone to vest in the Union.- (1) All lands, minerals and other things of value underlying the ocean within the territorial waters, or the continental shelf, or the exclusive economic zone, of India shall vest in the Union and be held for the purposes of the Union. (2) All other resources of the exclusive economic zone of India shall also vest in the Union and be held for the purposes of the Union. (3) The limits of the territorial waters, the continental shelf, the exclusive economic zone, and other maritime zones, of India shall be such as may be specified, from time to time, by or under any law made by Parliament.". "125. Section 66A and Chapter IVA of the Motor Vehicles Act, 1939 (Central Act 4 of 1939). 126. The Essential Commodities Act, 1955 (Central Act 10 of 1955). 127. The Smugglers and Foreign Exchange Manipulators (Forfeiture of Property) Act, 1976 (Central Act 13 of 1976). 128. The Bonded Labour System (Abolition) Act, 1976 (Central Act 19 of 1976). 129. The Conservation of Foreign Exchange and Prevention of Smuggling Activities (Amendment) Act, 1976 (Central Act 20 of 1976). 130. The Prevention of Publication of Objectionable Matter Act, 1976 (Central Act 27 of 1976). 131. The Levy Sugar Price Equalisation Fund Act, 1976 (Central Act 31 of 1976). 132. The Urban Land (Ceiling and Regulation) Act, 1976 (Central Act 33 of 1976). 133. The Departmentalisation of Union Accounts (Transfer of Personnel) Act, 1976 (Central Act 59 of 1976). 134. The Assam Fixation of Ceiling on Land Holdings Act, 1956 (Assam Act I of 1957). 135. The Bombay Tenancy and Agricultural Lands (Vidarbha Region) Act, 1958 (Bombay Act XCIX of 1958). 136. The Gujarat Private Forests (Acquisition) Act, 1972 (Gujarat Act 14 of 1973). 137. The Haryana Ceiling on Land Holdings (Amendment) Act, 1976 (Haryana Act 17 of 1976). 138. The Himachal Pradesh Tenancy and Land Reforms Act, 1972 (Himachal Pradesh Act 8 of 1974). 139. The Himachal Pradesh Village Common Lands Vesting and Utilisation Act, 1974 (Himachal Pradesh Act 18 of 1974). 140. The Karnataka Land Reforms (Second Amendment and Miscellaneous Provisions) Act, 1974 (Karnataka Act 31 of 1974). 141. The Karnataka Land Reforms (Second Amendment) Act, 1976 (Karnataka Act 27 of 1976). 142. The Kerala Prevention of Eviction Act, 1966 (Kerala Act 12 of 1966). 143. The Thiruppuvaram Payment (Abolition) Act, 1969 (Kerala Act 19 of 1969). 144. The Sreepadam Lands Enfranchisement Act, 1969 (Kerala Act 20 of 1969). 145. The Sree Pandaravaka Lands (Vesting and Enfranchisement) Act, 1971 (Kerala Act 20 of 1971). 146. The Kerala Private Forests (Vesting and Assignment) Act, 1971 (Kerala Act 26 of 1971). 147. The Kerala Agricultural Workers Act, 1974 (Kerala Act 18 of 1974). 148. The Kerala Cashew Factories (Acquisition) Act, 1974 (Kerala Act 29 of 1974). 149. The Kerala Chitties Act, 1975 (Kerala Act 23 of 1975). 150. The Kerala Scheduled Tribes (Restriction on Transfer of Lands and Restoration of Alienated Lands) Act, 1975 (Kerala Act 31 of 1975). 151. The Kerala Land Reforms (Amendment) Act, 1976 (Kerala Act 15 of 1976). 152. The Kanam Tenancy Abolition Act, 1976 (Kerala Act 16 of 1976). 153. The Madhya Pradesh Ceiling on Agricultural Holdings (Amendment) Act, 1974 (Madhya Pradesh Act 20 of 1974). 154. The Madhya Pradesh Ceiling on Agricultural Holdings (Amendment) Act, 1975 (Madhya Pradesh Act 2 of 1976). 155. The West Khandesh Mehwassi Estates (Proprietary Rights Abolition, etc.) Regulation, 1961 (Maharashtra Regulation (1 of 1962). 156. The Maharashtra Restoration of Lands to Scheduled Tribes Act, 1974 (Maharashtra Act XIV of 1975). 157. The Maharashtra Agricultural Lands (Lowering of Ceiling on Holdings) and (Amendment) Act, 1972 (Maharashtra Act XXI of 1975). 158. The Maharashtra Private Forests (Acquisition) Act, 1975 (Maharashtra Act XXIX of 1975). 159. The Maharashtra Agricultural Lands (Lowering of Ceiling on Holdings) and (Amendment) Amendment Act, 1975 (Maharashtra Act XLVII of 1975). 160. The Maharashtra Agricultural Lands (Ceiling on Holdings) (Amendment) Act, 1975 (Maharashtra Act II of 1976). 161. The Orissa Estates Abolition Act, 1951 (Orissa Act I of 1952). 162. The Rajasthan Colonisation Act, 1954 (Rajasthan Act XXVII of 1954). 163. The Rajasthan Land Reforms and Acquisition of Land-owners' Estates Act, 1963 (Rajasthan Act 11 of 1964). 164. The Rajasthan Imposition of Ceiling on Agricultural Holdings (Amendment) Act, 1976 (Rajasthan Act 8 of 1976). 165. The Rajasthan Tenancy (Amendment) Act, 1976 (Rajasthan Act 12 of 1976). 166. The Tamil Nadu Land Reforms (Reduction of Ceiling on Land) Act, 1970 (Tamil Nadu Act 17 of 1970). 167. The Tamil Nadu Land Reforms (Fixation of Ceiling on Land) Amendment Act, 1971 (Tamil Nadu Act 41 of 1971). 168. The Tamil Nadu Land Reforms (Fixation of Ceiling on Land) Amendment Act, 1972 (Tamil Nadu Act 10 of 1972). 169. The Tamil Nadu Land Reforms (Fixation of Ceiling on Land) Second Amendment Act, 1972 (Tamil Nadu Act 20 of 1972). 170. The Tamil Nadu Land Reforms (Fixation of Ceiling on Land) Third Amendment Act, 1972 (Tamil Nadu Act 37 of 1972). 171. The Tamil Nadu Land Reforms (Fixation of Ceiling on Land) Fourth Amendment Act, 1972 (Tamil Nadu Act 39 of 1972). 172. The Tamil Nadu Land Reforms (Fixation of Ceiling on Land) Sixth Amendment Act, 1972 (Tamil Nadu Act 7 of 1974). 173. The Tamil Nadu Land Reforms (Fixation of Ceiling on Land) Fifth Amendment Act, 1972 (Tamil Nadu Act 10 of 1974). 174. The Tamil Nadu Land Reforms (Fixation of Ceiling on Land) Amendment Act, 1974 (Tamil Nadu Act 15 of 1974). 175. The Tamil Nadu Land Reforms (Fixation of Ceiling on Land) Third Amendment Act, 1974 (Tamil Nadu Act 30 of 1974). 176. The Tamil Nadu Land Reforms (Fixation of Ceiling on Land) Second Amendment Act, 1974 (Tamil Nadu Act 32 of 1974). 177. The Tamil Nadu Land Reforms (Fixation of Ceiling on Land) Amendment Act, 1975 (Tamil Nadu Act 11 of 1975). 178. The Tamil Nadu Land Reforms (Fixation of Ceiling on Land) Second Amendment Act, 1975 (Tamil Nadu Act 21 of 1975). 179. Amendments made to the Uttar Pradesh Zamindari Abolition and Land Reforms Act, 1950 (Uttar Pradesh Act I of 1951) by the Uttar Pradesh Land Laws (Amendment) Act, 1971 (Uttar Pradesh Act 21 of 1971) and the Uttar Pradesh Land Laws (Amendment) Act, 1974 (Uttar Pradesh Act 34 of 1974). 180. The Uttar Pradesh Imposition of Ceiling on Land Holdings (Amendment) Act, 1976 (Uttar Pradesh Act 20 of 1976). 181. The West Bengal Land Reforms (Second Amendment) Act, 1972 (West Bengal Act XXVIII of 1972). 182. The West Bengal Restoration of Alienated Land Act, 1973 (West Bengal Act XXIII of 1973). 183. The West Bengal Land Reforms (Amendment) Act, 1974 (West Bengal Act XXXIII of 1974). 184. The West Bengal Land Reforms (Amendment) Act 1975 (West Bengal Act XXIII of 1975). 185. The West Bengal Land Reforms (Amendment) Act, 1976 (West Bengal Act XII of 1976). 186. The Delhi Land Holdings (Ceiling) Amendment Act, 1976 (Central Act 15 of 1976). 187. The Goa, Daman and Diu Mundkars (Protection from Eviction) Act, 1975 (Goa, Daman and Diu Act 1 of 1976). 188. The Pondicherry Land Reforms (Fixation of Ceiling on Land) Act, 1973 (Pondicherry Act 9 of 1974). ".